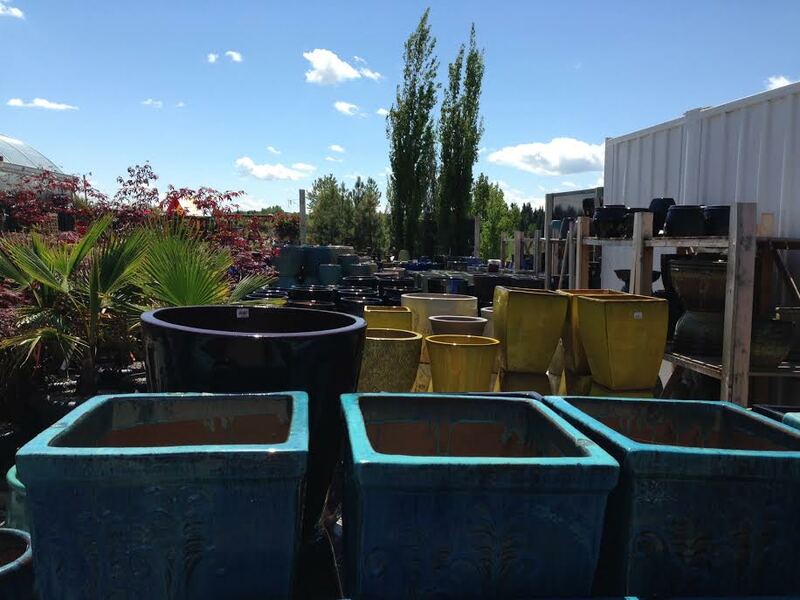 When I stopped by “Spruce It Up” garden centre in Calgary to pick up a couple plants I came across a treasure trove of ceramic pots. During my previous (first) visit, there, I was head-down in the rain, on a mission to find a Medora juniper, which I found and beat a hasty retreat. 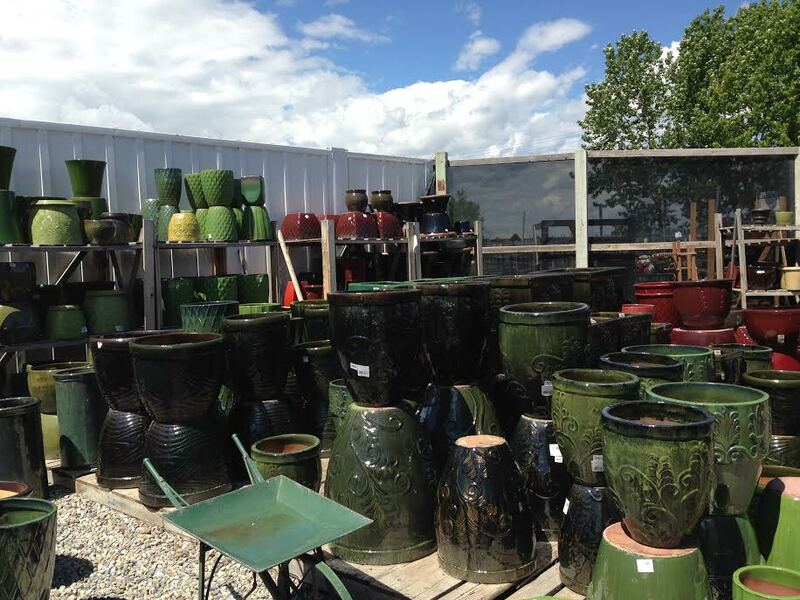 This trip I took my time looking around and found a wide variety of annuals and perennials as I would expect, but also a fantastic display of fountains, birdbaths, garden ornaments and piles of pots – displayed by colour – oh yes, the organizer in me was gleefully punching my gardener self in the arm. The possibilities! Did I buy anything? No but my mind is imagining future possibilities. 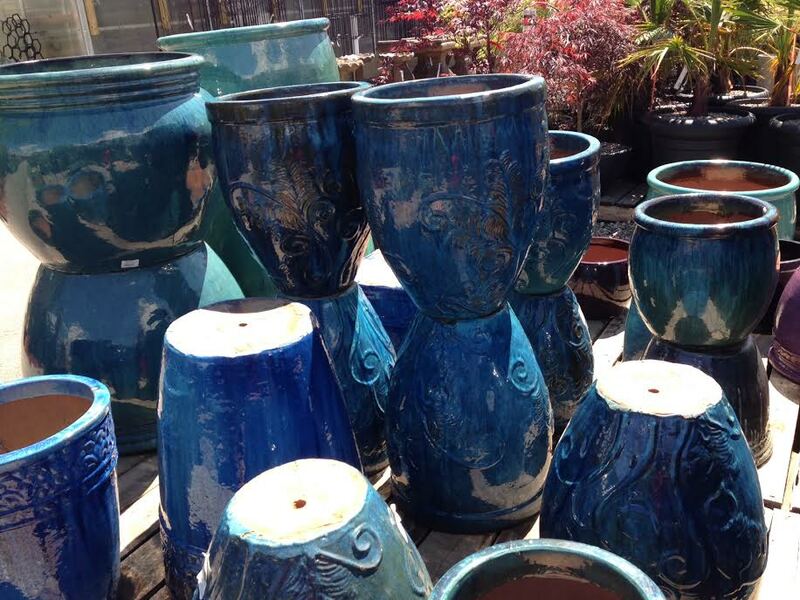 I love the blues and they would go well with my grey deck, but I don’t really need more pots. The green would look great at the back of a flower bed, adding another layer of height to the landscape. Red or yellow could be an interesting tomato pot. I have a lot of fun mulling over possibilities before actually committing to a purchase. It extends the fun considerably, and possibilities are often as cheery as an actual possession! 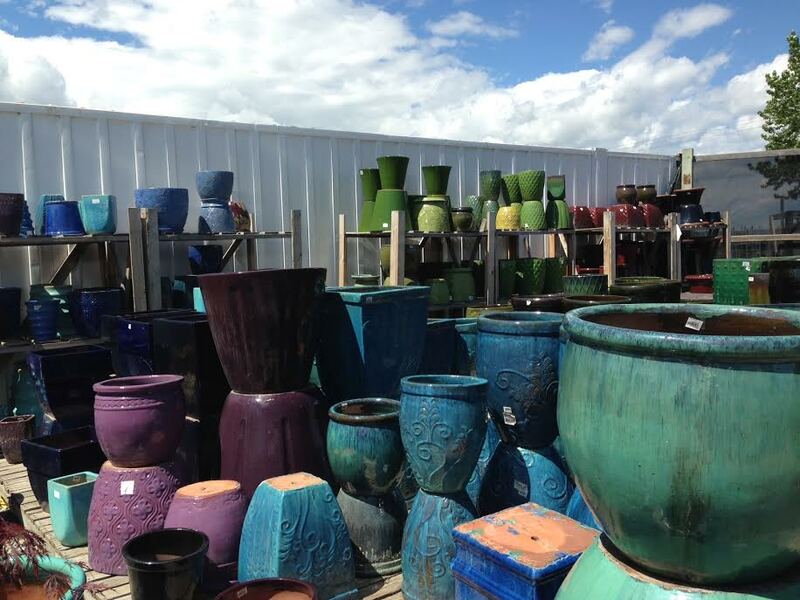 What a beautiful display of pots! The colors are fabulous. I like that little green metal wheelbarrow in the bottom pic too (which I suppose the nursery actually uses and doesn’t sell). It was for sale! However, purely ornamental – the wheel doesn’t turn. I checked :). I love that you picked that detail out of a busy photo. Lol. I would have checked too. So cute. Thanks! Love the photos and colors! Great blog! Thank you. I am having fun figuring it out.